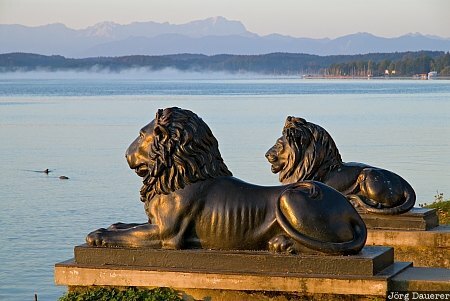 Two iron lions at the edge of Starnberger See near Tutzing illuminated by warm morning light with the Bavarian Alps in the background. Tutzing is south of Munich in the county of Oberbayern, Bavaria, Germany. This photo was taken in the morning of a sunny day in October of 2009. This photo was taken with a digital camera.